Prestigious Japanese chef Nobu Matsuhisa once said, “The fine art of preparing sushi is something that you watch and learn”. We couldn’t agree more. 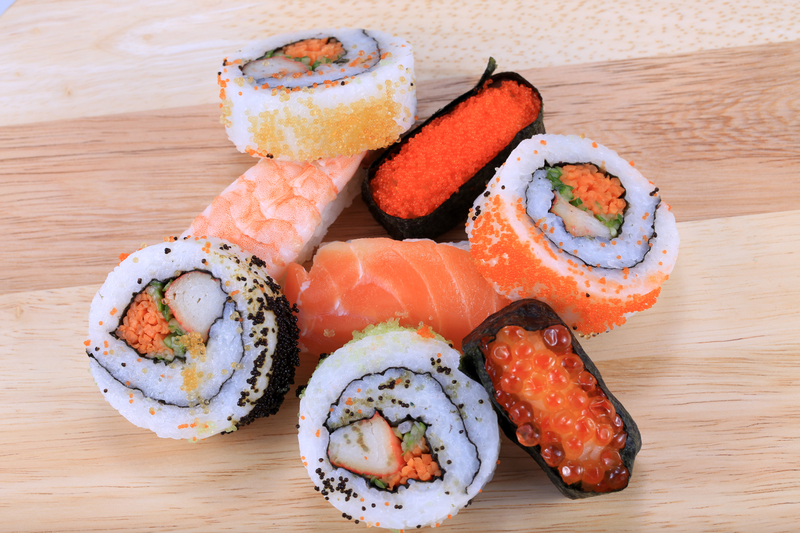 Indeed, sushi is nothing less than a delicate art that needs to be studied and appreciated. Whether you’re already a sushi chef or getting ready to take the first big step in becoming one, find out what the best sushi knives are. Explore our well-researched collection below, from yanagiba to deba or usuba knives, and many more. Not everyone looking for the best sushi knife is a professional chef. Some are passionate about Japanese cuisine and just want to start creating their own dishes at home or prepare for a career in the industry. If you want to take your sushi smarts to the next level, you need an introductory knife you can count on. We suggest you try the Wusthof Classic 4526WS. It is a beautiful 9-inch, single-beveled sushi knife that is currently available for a little less than $100 on Amazon. 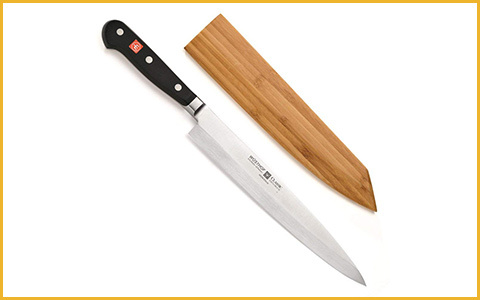 We chose the Wustof 4526WS as the best sushi knife for novices owing to its easygoing design. With a blade that measures 9 inches long, the Wustof isn’t too difficult to handle if you’re not used to larger knives. At the same time, it’s not so short that you’ll subsequently have a harder time maneuvering a 10.5-inch sushi knife if you decide to upgrade. A few customers feel that the blade is rather on the thick and short side, but we believe it’s perfect for those who want to learn. The Wusthof brand has a strong worldwide reputation for excellent German quality. As opposed to most other commercial knives, Wusthof models rarely have complaints of breakage connected to their name. Users are also highly pleased with the performance of the 4526WS knife. 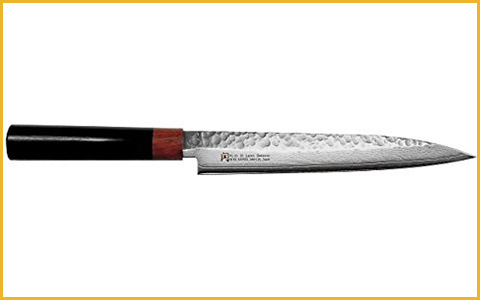 It’s a well-balanced model with just the right weight for effortlessly slicing through fish or sushi rolls. Ensure that you store your Wusthof in the lovely complimentary bamboo sheath it comes with. We encourage you to try the Wusthof Classic 4526WS if you’re just getting started on your sushi journey. It will help you get accustomed to the process while preparing you for developing your skills even more in the future. There is quite some debate in the community regarding ceramic knives. While some sushi chefs only stick to high-carbon Japanese steel for their collection, others choose the convenience of ceramic blades. If long-term sharpness is the selling point you’re after, we definitely recommend a ceramic model. From our perspective, the Kyocera Kyotop model is easily the best sashimi knife in its category. It retails for well over $300, but you can often find it on sale for $250 or even less. Upon receiving your Kyocera, you’ll see that it comes elegantly packaged in a black gift box. When you open it, you’ll find one of the most breathtaking ceramic knives you’ve ever laid eyes on. The Kyotop has a striking finish inspired by the traditional Japanese Damascus pattern. With a total length of 14 inches, the Kyocera features an 8.25-inch ceramic blade and a weight of merely 1.76 ounces. Despite its light weight, the Kyotop is balanced for all stages of the sushi preparation process. Considering its extremely high price point, the Kyotop actually follows through with the quality you expect. The advanced blade is created using hot-isostatic pressing technology, which, according to the manufacturers, makes it “close in hardness to diamond”. Surprisingly, it is indeed one of the hardest materials, which also results in extraordinary edge retention. To ensure a long and satisfying product life, we recommend sending it to Kyocera when the times comes to re-sharpen it. If you’re an active sushi chef with high standards, you can’t get any better than the Kyocera Kyotop. It is a top-of-the-line ceramic sushi knife that will provide long periods of exceptional performance without requiring constant re-sharpening. A key part of any sushi dish is the sashimi, which translates to “raw fish”. Although you can use a multi-purpose sushi knife for the whole process, advanced chefs will seek the best sashimi knife to add to their collection. One of the most popular types of sashimi knives is the yanagiba, which features the long and slender silhouette we associate with sushi cutlery. Few yanagiba pieces outshine the Dalstrong model, an alluring sashimi knife that costs approximately $120 on Amazon. Every aspect related to the Dalstrong yanagiba’s design will blow you away. Its hand-polished, single-bevel, 10.5-inch blade is made from Japanese super steel (AUS-10V) and features an eye-catching pattern. The traditional octagonal handle of the Dalstrong yanagiba is crafted from military-grade G-10 material mixed with red rosewood. In addition, the piece comes with a handmade wooden sheath that ensures long-term protection. The overall craftsmanship is absolutely amazing. 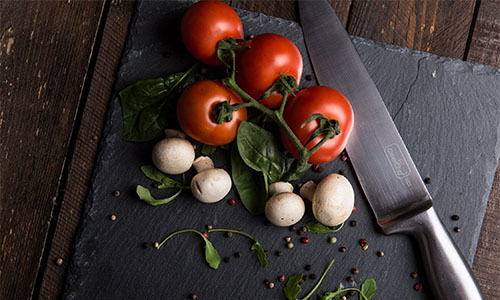 Dalstrong is one of the most popular cutlery brands among professional chefs thanks to their spectacular quality and service. Their blades are extremely sharp and durable, providing precise cuts with every movement. Even though the yanagiba may be a bit challenging to sharpen, a dedicated chef will always set the time aside for the task. A few other customers also complained that it’s on the heavy side, but the weight actually helps you apply less pressure when slicing. 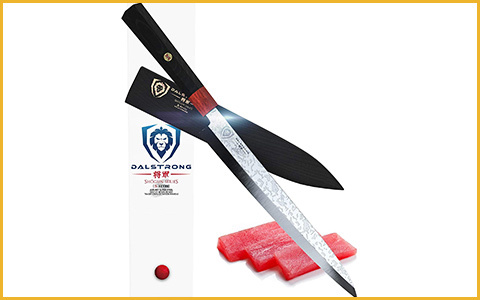 We fully recommend the Dalstrong model as the best sashimi knife in the yanagiba category. It’s gorgeously crafted, wonderfully precise, and a long-term investment suitable for any professional kitchen setting. As we slide into specialty sushi knives, we want to introduce you to the usuba. 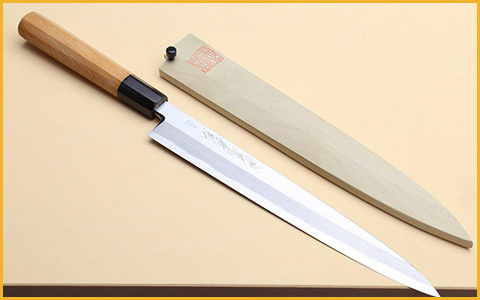 It is the best sashimi knife for working with vegetables and an indispensable item in the kitchen of a sushi chef. If you want to obtain paper-thin veggie slices for your sushi, we encourage you to invest in the Shun Pro VG0007. The model is one of the best Shun sashimi knife options on the market, praised by users for its sharpness and performance. It does cost about $180 on Amazon, but the usuba is worth it. The Shun Pro VG0007 follows the traditional usuba design, with a rectangular silhouette and hollow-ground back. It measures 12 inches with a 6.5-inch high-carbon blade made from VG10 steel. The Pakkawood handle is sculpted into a D shape for added comfort and maneuverability. If you want to focus on getting perfect vegetable slices, the Shun usuba is the best sushi knife out there for the job. For the best results, we recommend using a “pull” movement instead of a “rocking” one. Shun knives are known for being top quality. However, we’re sad to report that a few customers have noticed a recent drop in quality. According to some users, the usuba’s finish isn’t top-notch liked it used to be, not to mention that their customer service is unresponsive. Be that as it may, the usuba provides a remarkably comfortable grip and holds an edge for quite a long time. 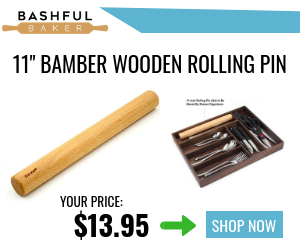 The piece is a must for any chef that strives for professional results with every sushi dish. You should buy the Shun Pro VG0007 if you require the best sushi knife for slicing vegetables. It performs extraordinarily well for super thin cuts, all while maintaining its sharpness for long periods of time. Another specialty knife that sushi chefs should not overlook is the deba. 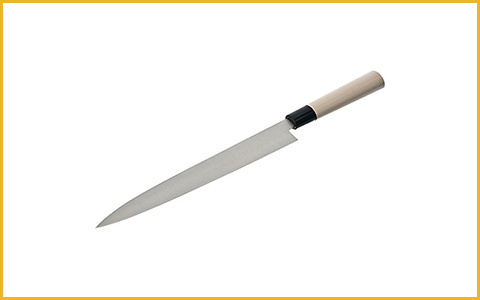 Traditionally used for whole fish, the deba is the ideal knife for any large, hard-to-cut items. 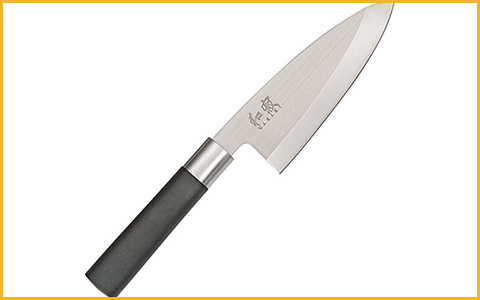 If you’re looking for a deba that won’t bruise your budget, the Kai 6715D is top value. It currently costs only about $45 on Amazon, which is an incredibly low price to pay for a deba that is crafted in Japan. As opposed to other accessible Japanese knives, the Kai deba actually performs just as well as a high-end model. For their deba knife, Kai used daido 1k6 stainless steel that is high in carbon. The single-bevel blade is 6 inches long, which may be a bit on the short side for the tastes of some. However, the compact blade is simply perfect for cutting through large fish like butter. In fact, it’s so effective for difficult cutting jobs that many home chefs use it for carving turkeys or going through whole chickens too. The D-shaped Pakkawood handle will feel comfortable even after prolonged use. In terms of performance, there really are no genuine complaints regarding the Kai deba. It slices like a beast even through the hardest food items, all for an astounding price. The Kai model looks, feels, and performs like an extremely durable knife. Some believe that the handle could be a bit flimsy, but we have yet to find reports of cracking or breakage. There truly is no better value out there right now in the deba knife category, particularly if you’re preparing sushi at home. We support the Kai 6715D as the best sushi knife in its class, ideal for working through whole fish. It’s one of the most affordable deba knives on the market that doesn’t sacrifice quality despite its low price. We’ve talked about yanagiba and deba knives, some of the most common sashimi models used by amateur and pro chefs alike. Still, what is the best sashimi knife out of all subcategories? At the moment, the SETO Traditional Elite I-7 takes the win as far as sashimi knives are concerned. Created by world-famous Yoshinori Seto, the I-7 is hand-crafted in the city of Seki, renowned for Japanese cutlery. If you order the SETO I-7 on Amazon, you’ll currently pay just a bit over $100. 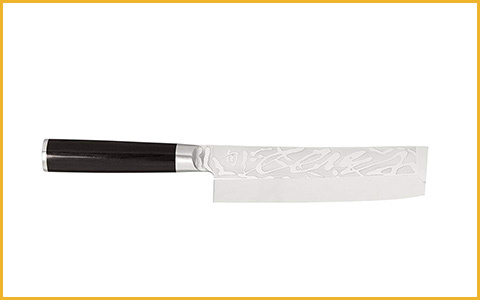 With an 8.25-inch blade, the I-7 can be used by chefs of all levels. It is a traditional sashimi knife that features a D-shaped, red sandalwood handle and plywood bolster. The forged blade contains 33 layers of Japanese Damascus steel with a VG-10 stainless steel core. It has a Rockwell hardness rating of 60, which is more than enough for prepping sushi like a pro. Thanks to the authentic artisanship, you can use the SETO I-7 both at home and in a commercial kitchen setting. You shouldn’t have any issues working with the SETO I-7. It’s the best sashimi knife in its class, produced by an iconic figure in the Japanese cutlery industry. The knife comes razor sharp out of the box and can be used for all parts of the sushi preparation process. Even though it may not hold an edge as long as the other best sushi knife options on our list, it’s really easy to re-sharpen. The sparkling finish will definitely draw the attention of guests and spark compliments. Try the SETO Traditional Elite I-7 if you’re on the hunt for the best sashimi knife. It’s notably accessible for an authentic sashimi knife and won’t disappoint even the strictest of sushi chefs. The best sushi knife models always come at a price. Rarely can you purchase an authentic Japanese knife without spending at least $100 dollars on it. For beginners, it can mean making a massive investment before even knowing how to properly use a sushi knife. Whether you’re shopping on a budget or you want to practice on a cheaper knife, the Happy Sales HSSR400 is the best sushi knife for you. It only costs around $18 on Amazon, making it one of the least expensive knives on our list. The Happy Sales knife has a few favorable characteristics as a sushi knife. 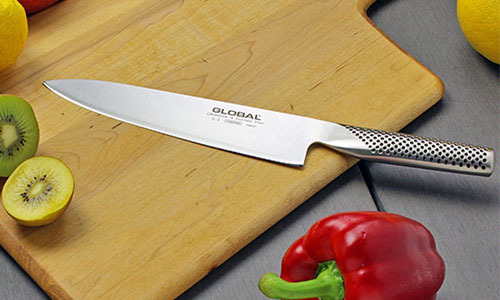 Firstly, it follows the traditional Japanese design of a single-bevel blade with a D-shaped handle. The blade is crafted from molybdenum steel and is 8 inches long. As a result, you won’t have a hard time working with it as a beginner. The Happy Sales sushi knife is perfect if you want to learn and practice basic sushi cuts, such as katsuramuki, hirizukuri or sogi giri. You can also use it for mastering the sharpening process. You shouldn’t expect much from a sushi knife that costs less than $20. It won’t provide years of service, nor will it be suitable in a professional setting. Nevertheless, knives like the Happy Sales model will prove to be extremely effective in gaining sushi prep knowledge. You’ll be able to model your techniques without damaging an extremely expensive blade. Additionally, the Happy Sales knife is actually pretty sharp and reportedly holds an edge for a long time. Don’t waste +$100 if you’re starting out with sushi or you’re buying your first specialty knife. The Happy Sales HSSR400 is just what you need for getting used to the tools and process. If you’re creating your whole knife collection on a budget, you should definitely check out our guide for the chef knives under $100. While some individuals are just beginning to become accommodated to the art of sushi, others may have years on end of experience. The latter case calls for a top-of-the-line knife that authentic professionals can count on. We’ve previously praised Yoshihiro for producing the best Santoku knife on the market. Now, we will explore the Yoshihiro Hongasumi HKYA300YH, the most expensive yet most effective sushi knife on our list. It retails for about $360, so prepare a generous budget for it. When you pay more than $350 for the best sushi knife, you’ll expect noteworthy cosmetic value. You won’t be disappointed upon receiving the Yoshihiro Hongasumi. It features a slender 11.8-inch long blade, crafted from blue steel #2. The superior blade meets the yew wood handle with a water buffalo horn bolster, all of which result in a jaw-dropping design and finish. As the perfect final touch, Yoshihiro delivers your sushi knife with a magnolia wood saya (blade cover). With a 63-64 Rockwell hardness rating, you know the Yoshihiro sushi knife is as durable as they get. The blue steel used for the blade is one of the finest materials available, and it’s expertly shaped and polished by Japanese artisans with extreme attention to details. We only found one complaint of chipping, but other customers agree that it was most likely due to improper use. The only slight downside concerning the Yoshihiro Hongasumi is that it’s only recommended for pro sushi chefs. If quality is what you seek the most in the best sushi knife, go for the Yoshihiro Hongasumi. Indeed, it is expensive, but it’s a piece that will deliver well over a decade of professional results. You can also look into our list of the best Japanese chef knives you can buy this year for more inspiration. Although you probably won’t catch sushi knives with holes in a commercial setting, some customers prefer a design of this kind. Theoretically, the holes in a knife’s blade have anti-stick properties and also allow the user to push down on items while cutting them. If you’re interested in getting the best sushi knife with holes in its design, we suggest the Kitchen + Home SE-009. It currently costs less than $10 on Amazon, where it’s one of the top three best-selling items in the Sashimi knives category. Although it is marketed as a sushi knife, the Kitchen + Home model basically follows the silhouette of a classic chef knife. While this may be disappointing for some users, others will appreciate that they can use it for other purposes aside from making sushi. 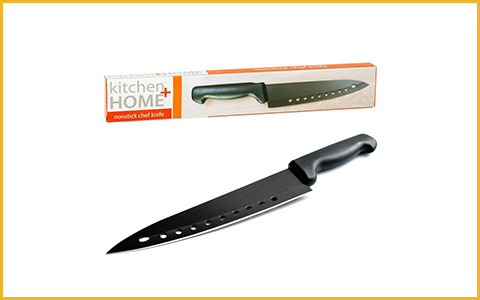 The Kitchen + Home knife is 13 inches long, with an 8-inch stainless steel blade that features ten holes from the tip to the bolster. Also, the ABS handle prevents slipping if you’re using the knife directly after washing it. The SE-009 knife has a coating of Teflon that reportedly reduces sticking and friction together with the holes. However, numerous customers have complained about the coat chipping or peeling off in certain areas. Additionally, even though it’s a sharp and versatile model, the partial tang is very fragile and prone to breaking. At this price point, it would be unrealistic to expect more of the knife. The Kitchen + Home SE-009 knife isn’t the best sushi knife out there in terms of quality, but it’s a reasonable choice if you want a design with holes. 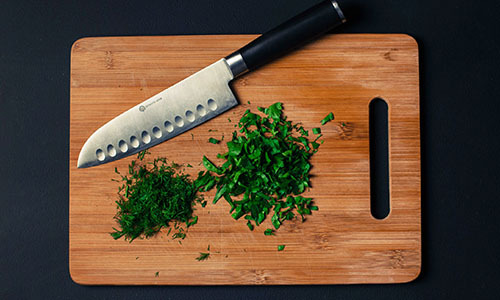 You can also browse the best chef knife under $50 if you want additional low-budget options. Considering that Yoshihiro is among the most respected Japanese cutlery brands, it’s natural that our #1 pick comes from them. After extensive research, we stand behind the Yoshihiro Shiroko KKYA240MH as the best sushi knife of the entire year, made by true Japanese artisans. The Shiroko is fairly priced, beautifully-crafted, and easy to use by both amateurs and professionals. At the time we were creating our review, the Yoshihiro Shiroko had an Amazon list price of about $160. The Shiroko has a 9.5-inch blade made from premium white steel #2. As a result of the mid-range length, the model will be comfortable for all types of users. The handle is made from magnolia wood, which is also the material used for the wooden sheath you receive with your purchase. Even more so, you receive a knife oil and rust eraser with your package. The overall value you enjoy with the Yoshihiro Shiroko is tremendous. Some customers have complained about getting rust spots or a broken tip. 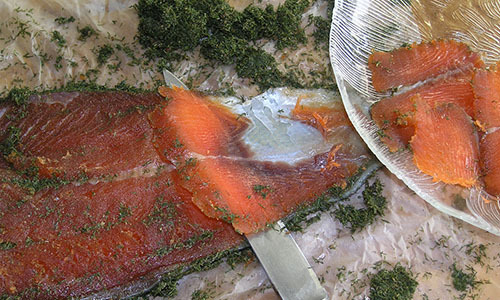 As seasoned sushi chefs will know, the blade material used for sashimi knives is high in carbon to increase durability. 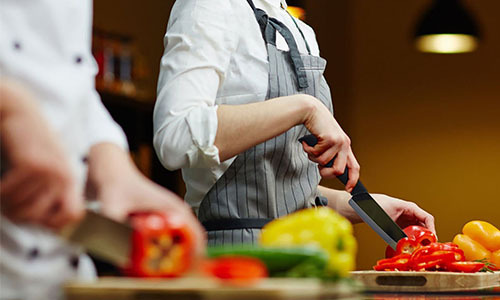 A pro chef won’t expect the blade to avoid corrosion altogether, especially when maintained improperly. Aside from that, the beautiful Shiroko is a true gem among sushi knives, with superior quality, performance, and general value. 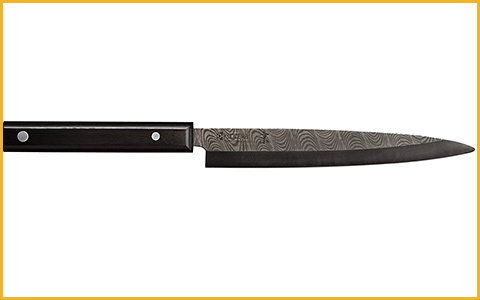 We recommend the Yoshihiro Shiroko KKYA240MH as the best sushi knife you can invest in this year. It has the most balanced features for chefs of all levels of experience, all while delivering the quality Yoshihiro has become famous for. In conclusion, the best sushi knife truly depends on the requirements of the chef. If you’re a beginner, you may be better off with a budget knife to practice with. On the other hand, pros can venture into superior options with blue steel, magnolia handles or other advanced features. As a parting thought, if you’re just getting started with the art of sushi, you should gather extra tips and tricks on making it. 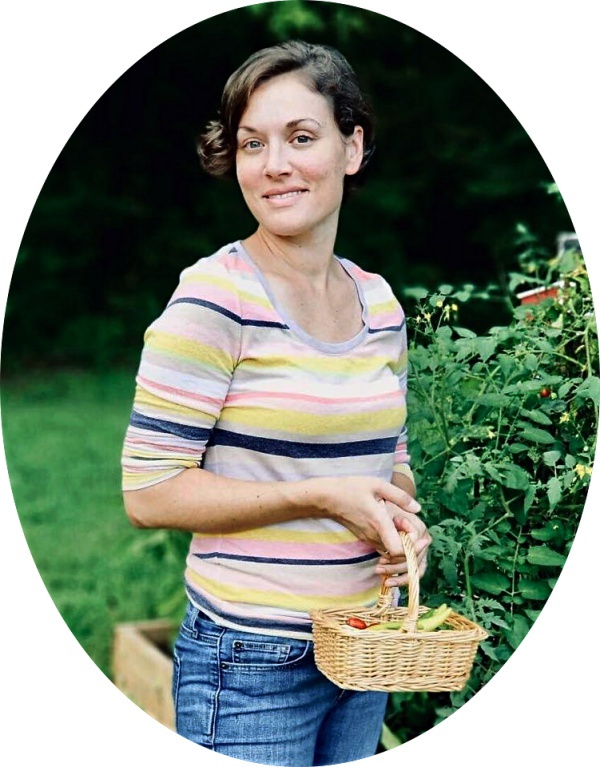 Respect the culinary art and enjoy the process!